After 6 straight weeks of warm sunny weather, it's been cool and rainy all week. Since Mitchell's quilt is done, I thought I'd sew up some simple mug mats. Mug Mats are all the rage in blogland.. so I thought I'd give them a try. They are bigger than a coaster and usually bound. I did a little free motion and a little straight stitching. I enjoyed making them. The sun comes back tomorrow, so it's back to the beach to look for sharks teeth... which is one of our daily activities... to bring home to the kiddos..of course. Here is my third placemat that I made for use at our upcoming quilt show. From one of the quilting bloggers that I follow, I discovered a neat new tool that I'll use for quilting from now on. It's a gel pen with magic capabilities. I bought a set of 2 of these Pilot Frixion pens for $5.00 at a local drug store. They are available anywhere you can buy office supplies. I checked on Staples.ca website, and they have them there but it says they are not in the retail stores. I am hoping that it's just referring to the 6-pack. Here is how used the FriXion pen. I used the FriXion pen to mark where I wanted to quilt on my placemat. I marked the entire placemat before I layered on the batting and backing. So far the process is the same as last weeks placemat, when I used a pencil. Then layer, and machine quilt your piece as usual. The great thing about this gel pen, is that after you have finished quilting on your fabric, you can make the marks totally disappear (almost instantly) with the passing of a hot iron over them. Now, that's not the end of the story. If for any reason, you need your marks to re-appear, simply put your fabric piece in the freezer. The marks will re-appear. Make them disappear again with the hot iron. To permanently remove the marks, you will lightly launder your piece with a mild soap. Here is the package of pens that I bought. The pens are available in different colors. I bought the black ones. Later this week, I am going to do a couple of small mug mats as samples, and let the gel ink dry for a month or so before ironing and laundering, just to see what the result is. Almost seems to good to be true, eh! A note to any of my quilting buddies in Canada ... Will you let me know if you find any FriXion Gel pens in any of the local office supply sections of stores. If they are hard to find, I'll bring a supply back with me. I stumbled across this bottle of tender Cactus at the grocery store today. It may be known as nopalitos to people in Mexico. I have never heard of it. This bottle of tender cactus was not not expensive, about $1.50. Directions: In a medium size mixing bowl, combine cactus, tomatoes, onions, jalapenos and cilantro. Sqeeze the juice from both lemons over the mixture. Cover and refrigerate for at least 1 hour. Sprinkle with garlic salt (if you like) and serve. While snowbirding in South Carolina, I love our little trips to the grocery store - usually every other day. I would say that 75% of the groceries are different that what we have Sobeys, or the Superstore. I saw an advertisement on TV for Special K. Special K chips that is. At first I thought, chips for breakfast, how cool. But they are intended as a low calorie lightly salted snack ... if you eat just 17 chips. They're delicious. The Special K crackers are really nice too. I'm not sure if they are in Canada yet, but I'm going to buy some of these to take home with me, just in case they're not available. I had fun doing this weeks placemat. For my second placemat, I intended to do some free motion around some words and my friend Lee suggested the words - Bon Appétit. I thought that was a fabulous word. I set out on a search for a great font or clipart that I would use to trace this word. I searched with Google and Bing and came across many clipart images. I chose this one, keeping in mind stops and starts with my stitching. All I had to do was to add the accent over the é. Tape your paper image on a window or patio door. ﻿﻿Here is how I transferred this image to my placemat. First, I copied the clipart to an MS Word document. Within the document, I just grabbed the corner of the image and stretched the image large enough to fit nicely on my placemat. After printing, I cut away the excess paper and taped it on my patio door. While properly positioning over the clipart, tape the placemat to the window. Trace lightly with pencil around the words. Trace very lightly. This might be a little darker than it needs to be. Free Motion stitch following your pencil lines. And Voila - Here is the finished place mat. Thanks for the fabulous suggestion Lee. I might make another version of "Bon Appétit" next week as well. Different stitching, of course. I'm pleased with myself this week. This morning, I finished sewing the blocks for Mitchells' quilt. That's means that all 147 birds are done. Whew, I think I'm going to make my month end target to have this top done. 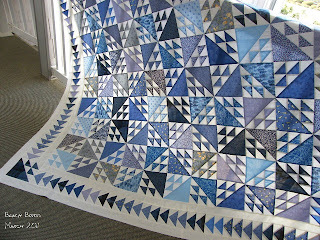 I'm glad to be moving on to the next step which is sewing them all together to make the center of the quilt. Then it's assembling the 4 border pieces and attaching. I hope Mitchell likes it. Check back in next week. I know it sounds weird, but I bought a necklace made from yarn from a crafter at this past weekends St. Patrick's Day Craft Market. It is made from a very textured yarn... not the normal sweater kind. This necklace has several strands and I believe it was crocheted. It was only 7 dollars and I thought it was so neat. I'll wear my new yarn necklace when we go out to dinner next week. We'll be celebrating our 27th anniversary. Our guild is having a quilt show at the end of April. We've been asked to make placemats that will be used as part of the decor. After the quilt show, the placemats will be donated to a local community organization. I plan to make 3 or 4 placemats, and here is the first one I finished. 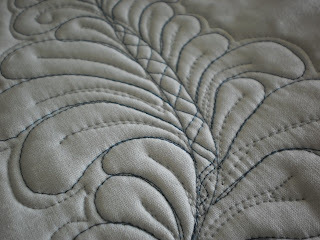 I practiced some machine quilting techniques... I was following Judy Woodworth's Freemotion Quilting book. There are nice ideas in using multiple techniques. I had some difficulty. I'm pretty comfortable making feather sprays, but adding the outer designs proved to be harder than it looked. I'm hoping next weeks placemat is better.. I missed reporting last week on Mitchell's quilt because I was away on vacation. We only got home on Tuesday, so yesterday and today, I have made another 24 birds. So now that's a total of 66 birds out of the 147 that I need. I need to pick up the pace if I am to finish this by the end of March. My goal this week is to make at least 60 blocks and if we get a day or two of rain, maybe I'll shoot for the 80. That leaves me two weeks to put it all together .. just in time to send it back to NB to get quilted before our show. It's amazing how quick the time is going. We've been gone almost a month already. We arrived back to the Beach yesterday. It's nice to go on a cruise, but it was nice to get back on land and get back to normal. Even though there are no bathroom scales here at the beach condo, I'm going to do a serious bit of dieting to take off those newly gained cruise pounds.. I'm glad I have some quilt projects to work on as a distraction. While I was away, I received 2 books that I ordered along with the extra fabric I needed to continue working on Mitchell's quilt. Both of these books have been on my list for a while now, and after leafing through them briefly, they were both good purchases. There are many great scrappy style quilts, but the reason I bought Country Comforts by Cheryl Wall was this quilt called "Days and Nights of Wine and Roses". This looks like a pretty easy quilt to make and it really appeals to me. It's now on my to do list when I get home and back to my stash. 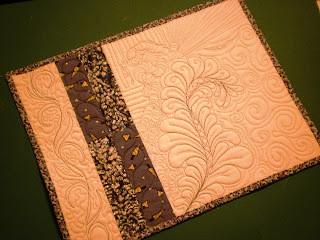 I really enjoy free-motion quilting, so the next book, Judy Woodworth's Freemotion Quilting, really looks inspirational to me and I can't wait to get started. I brought stash to make place mats, so ﻿I won't have to wait until I get home to use some of Judy's suggestions and techniques. These two techniques are the first two that I'll try. The first is creating a large central feathered motif, then filling in with multiple background motifs. 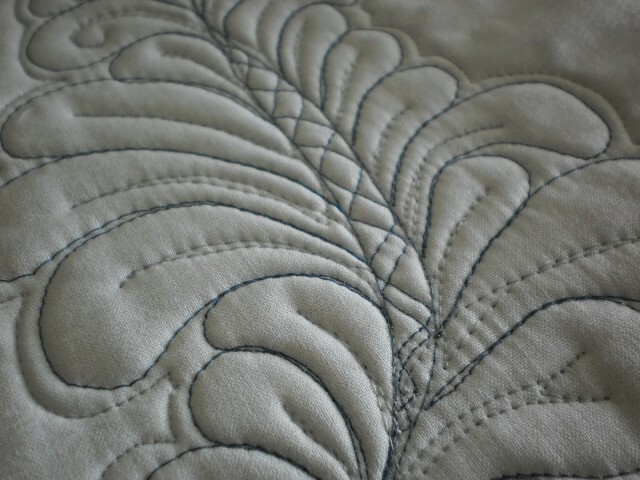 The second of Judy's demonstrations that I will try is using background quilting to highlight a non quilted section. I like this example of using letters. I'll have to think about a specific word to use on my place mat... Do you have a suggestion? The place mats for use at our guilds quilt show in late April and the theme is Spring. In Costa Rica, we visited the place where Christopher Columbus landed in 1502. 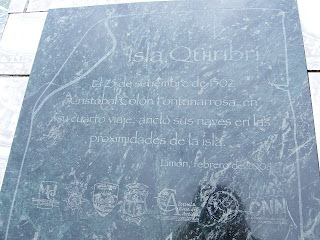 It was it 3rd or 4th voyage to this continent. 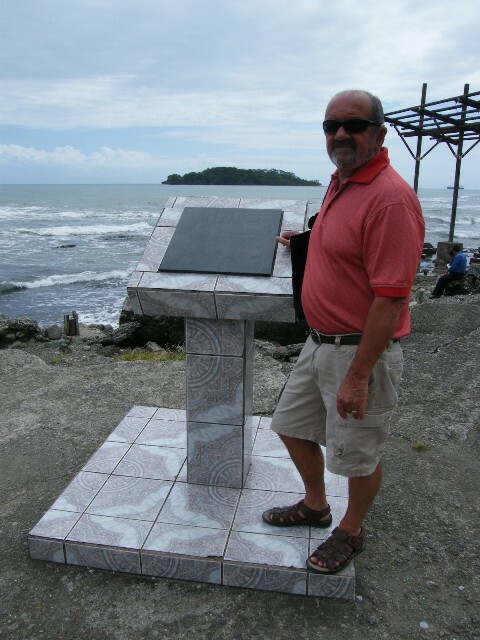 Near this monument, we also got a picture of a rare sloth. 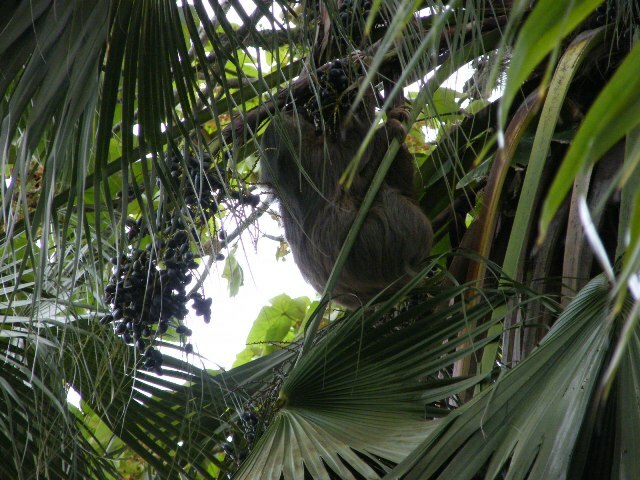 He's sleeping high up in a tree. 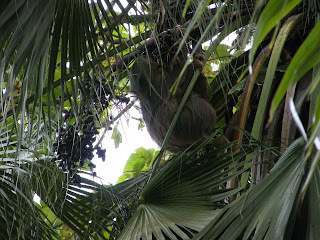 We would have never spotted him without the help of a young Costa Rican named Reanthony. We gave him a buck. He ran away happier than you know what. 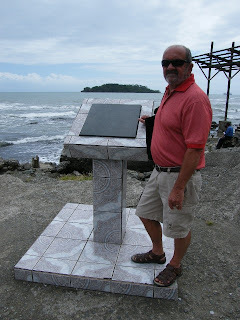 This morning we pulled into Costa Rica. We've been here before, and I recall what I thought when I saw the mountains the first time, and then this morning too. Lighter, Greyer, further away. That's Joen Wolfrem's chant to us when we were trying to decide on color values for a landscape. Here's a perfect example. The mountains in the back are lighter and further away. PS: Can you tell that I'm starting to miss my daily sewing. One fun part of a cruise is getting the towel creatures. Here are a couple that we got this week so far. Note: Added more on Saturday. One fun thing we did in South America, is to stop in at the Juan Valdez Coffee House. It's like our Tims. We left Florida on Friday and headed to the open water. As we left, we saw the most beautiful sun setting behind the Miami skyline. Early Sunday we awoke early to watch the docking of this huge ship in Haiti. The sun was just rising over the mountains. We’ve been sailing the high seas now for 3 days. Today, we are in South America. It’s hot here. We are having a cup of java at the popular Juan Valdez Coffee shop. I’ll be buying some to bring home. We’ll have it the next time I host the Friday Girls coffee break.